Everyday Fray: From K - New Bengal Fabric and a Giveaway! A few weeks ago one of our favourite online fabric stores, Hawthorne Threads, emailed us wondering if we would like to participate in an exciting new venture they were launching - house designed digitally printed fabric! As long time lovers and supporters of their online store, we were thrilled to be able to get our hands on one of their stunning new lines - Bengal! 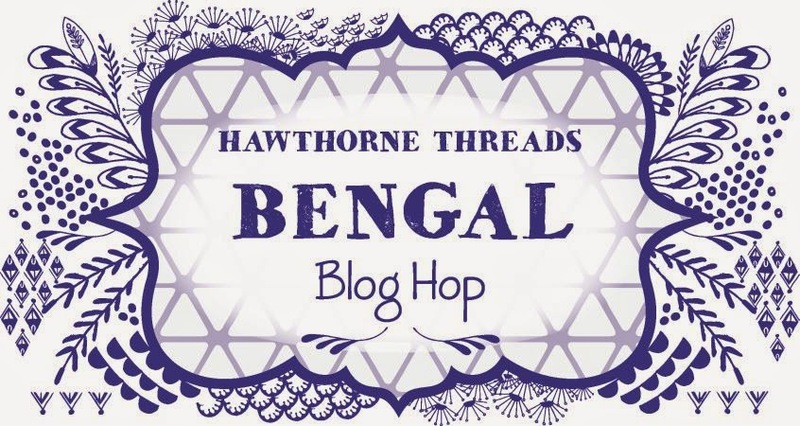 Today I'm honoured to be hosting the 3rd day of Hawthorne Threads' Bengal Blog Hop, as well as a generously sponsored giveaway from the designers themselves. Even before the fabric arrived, I had a million ideas swimming around in my head with all of the possibilities of what to create and share with you during our stop along the blog hop. After seeing some teaser images, I knew I would never be able to choose only one or two prints to play with, so when a FQ bundle landed on my doorstep I immediately started plotting out a way to use all of the beautiful fabric in one collective project. I typically strive for lots of colour variation in my quilts, but the idea of a two-toned Metro Rings Quilt had been stuck in my mind for ages, and the opportunity to use every Bengal print while accomplishing this concept had me sold. Knowing that finishing a throw quilt was a bit ambitious given my time frame, I came to my senses and settled on an achievable goal of turning 8 blocks into a set of matching pillows. Lindsay's designs definitely speak to me. Fine lines, curved strokes, modern in design, but also traditional and timeless in palette - I imagine you can see why choosing only one print to play with would have been nearly impossible. I especially love that while no two prints are the same, they all work very cohesively together. 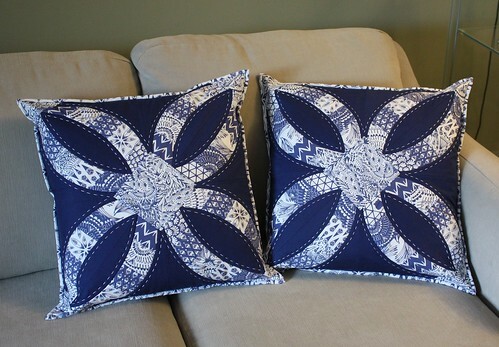 A yard of the Cascading Border print worked wonderfully for two zippered backs, and I am so glad I was able to tie that extra detail into the final pillows. In the above photo you can see the true colour of the Bengal indigo prints, a medium blue with a soft purplish undertone. I originally auditioned three solid background colours for my blocks (white, silver and navy), but decided on Hawthorne Hues in navy, which I think really makes the prints pop. Hawthorne provides some great suggestions when sewing with their digitally printed fabric, located on their website here. After working with Bengal these past few weeks, I have some tips and suggestions of my own that might also be useful. Before starting my pillows I noticed that Hawthorne suggested using a size 10/11 needle because the weave in this fabric is quite tight. Being the lazy sewer that I am, I tried to use a standard quilting needle but switched asap after my machine starting complaining loudly. Trust the professionals here and invest in a fine needle. I am not usually in the category of quilters that prewash fabrics, but I wanted to see how this digital fabric would hold up. I washed my Bengal yardage with some Hawthorne Hues and tossed in three Shout Color Catchers. I was impressed that after a good wash and dry, the fabrics didn't fade, they softened up a bit, and all three catchers came out clean (even with navy yardage in the same load!). This is the first time I have ever sewn curves, and I was surprised with how easy it was. The Quick Curve Ruler that I used helped a great deal with that, however I would also give credit to the tight weave of the Bengal fabric. The fine weave of this fabric (much tighter than regular quilting cotton) means this fabric really holds it shape well even when cut on the bias (a true benefit when working with curves!). The production process that is used to make Bengal uses a printer to lay pigment down on the surface of the fabric (check out Hawthorne's behind the scenes video here). 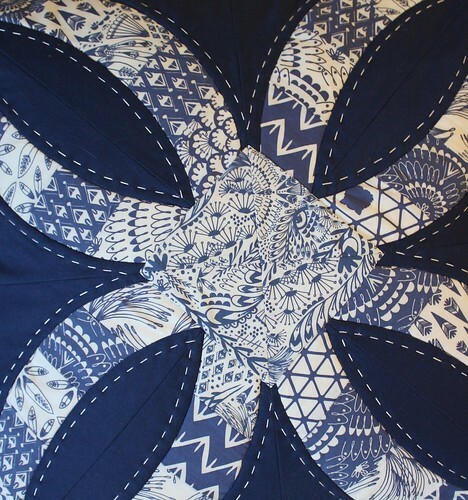 This is different from traditional screen printed quilt cotton. Because the pigment sits on top of the fabric, some argue that digitally printed fabrics are less durable than screen printed fabrics - with claims that rough wear or long-term folds can lead to fading or worn bits as the pigment wears away. I don't have much experience with digitally printed fabrics and can't speak to how these Hawthorne prints will hold up long-term since I've only washed them once and haven't really used the finished pillows. That being said, I'm impressed with the quality of the Hawthorne fabrics so far. Until the final verdict comes in, I'm dreaming of lighter wear items such as wall hanging, table runners, mini quilts, gift bags, pillows, or even window/shower curtains (how fun would that Cascading Border print be?!). Hawthorne Threads has generously sponsored a giveaway for this stop on the blog hop. To enter to win a FQ bundle of Bengal (shipped directly to you fresh from their digital printer), please comment below letting us know what you'd like to make with this line if you won. The contest will stay open for one week (closing at 11:59 pm MST on Tuesday November 11th, 2014). The winner will be announced on our blog later that same week. I'd also love to make some pillows. Yours are gorgeous!! Tablerunners and placemats would look awesome in these prints! I would make a couple of tote bags. I have a Bengal cat so my totes would be personalized with his name. I have a Tapa Star pattern for cushions that I plan to release soon and these would be great to make up and gift with this pattern to my Mum. Those pillows are beautiful! I think I might make a bag with that fabric if I won. Thanks! I've seen a number of lovely projects on this hop and my list of things to make with this fabric is growing. Your pillows have me drooling -- now I want to make some that are similar. Gorgeous! I would love to make a quilt or a tablerunner and pillows? Would love to make pillows and bags with this fabric! I would turn the fabric over to my daughter who would rummage through her collection of Indie patterns for something sensational to sew. Meant to say "not STOP looking". Duh! would make a beautiful bag! Envelope backed or zipper PILLOWS. This fabric collection gets more beautiful as the blog hop ensues. I've seen a demo of the quick curve ruler, now it's time to buy one. You did a fabulous job showcasing all the of this collection. I THINK I MIGHT MAKE US SOME PILLOWS TOO ! The fabrics are gorgeous! I would love to make a tote bag with these fabrics. Just wanted to say that this definitely showcases the blending of the prints. It looks very sophisticated adn classy. Love the way you've quilted it too! Love the pillows and I appreciate the comment about sewing curves as I recently made a quilt with the Quick Curve ruler and want to make another more challenging pattern. Thanks. What beautiful fabric! The colours are fantastic, and would be the perfect palette for a dining room table runner I've been plotting since I started quilting. I would like to make a three or four tiered skirt to show off as many of the beautiful Bengal fabrics as possilble. I think your pillows are beautiful, and u would love to make some like it for my living room. I would love to make a wall hanging quilt for our daughter who is getting married soon as those are her colors . Beautiful! I would make a cute dress for my baby that's due in February. I love your pillows. I would make a tablecloth for my kitchen table. Beautiful, I love the idea of curved piecing, so perhaps one of the other Sew Wonderful patterns, which I seem to be hoarding looking for the perfect fabric.Have I found it???? Terrific pillows- I think I would make some lovely pillows or a table runner. Thanks for the chance to win such pretty fabrics.. I love your pillows so I would make some and a table runner to match. Thanks! Those pillows are gorgeous! If I have to choose something other than pillows, I'd make a tote bag for a friend who loves blue. I hope to win! These pillows are amazing! I need to make a blue and white patchwork cushion for my son's toy chest/bench. These would be perfect! Your pillow is stunning. Love your quilting stitches. Thanks for the giveaway. i am collecting fabric for a blue and white quilt and these would be wonderful - love the colour and love the patterns of this fabric. I would make a vest. It would look wonderful paired with jeans or a denim skirt. I would make cushions for my daughter's sofa. She loves blue, but it's really difficult to find beautiful true blues without any hint of teal or aqua. These fabrics are perfect. Thanks for the chance to win. The fabric is wonderful. My favorite colors so I think I would make some blocks to frame on my wall. Wow, these look gorgeous. I love the two tone idea, I think I might have to try a quilt following these lines if I'm lucky enough to win. I see lots of navy and Bengal on my bed! I also really love your hand stitching, it sets it all off so well. Great job with these, I love them all, both sides! 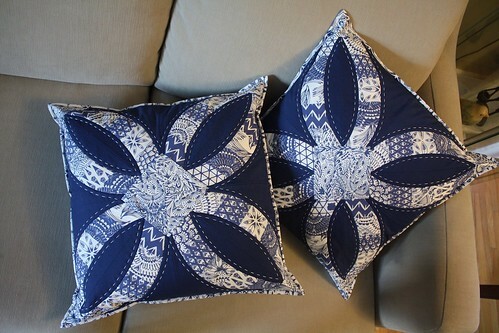 I would love to make some pillows and a quilt! Beautiful fabric! Thanks so much! The fabrics are beautiful and your cushion covers show them to good advantage. I would make a wall hanging, just for me. I'd make a quilt for a friend. Your pillows are gorgeous! Those pillow are so beautiful! I would make gifts...probably pouches. I'd make something quilty, of course! WOW your pillows are awesome. I would also like to make a couple of pillows or a table runner with the fabric. I'm thinking probably a tote bag. I'd love to showcase the tiger face on a tote for fabric shopping days. Just gorgeous! I love your pillows! I would make a clutch with the fabric. Such lovely colors. My mother would love a lap quilt from these! I'd make a lovely lap quilt to go on my navy sofa! Gorgeous new fabric!! Love it! I would be making some fabulous placemats for me! We just purchased a new home and I can see these beautiful fabrics as pillows and table runners in my new sewing room and living room! Lovely pillow! I'd love to use one of the prints to make a skirt. I love the indigo fabric wight the white decorative border and the floating dots-so beautiful- I would like to make a skirt with it. Honestly, some of it I would just want to frame... But in the end I'd probably make a clutch and pillows. I would fussy cut to make a special tote, pouch, and lunch bag for my daughter to take to Occupational Therapy. A friend is a huge tiger lover so something for her... probably use it make an apron. Thanks. I am loving this Bengal collection - I love the blue/white color combo and all the little details in the pattern. I would love to make a large bag or even a divided basket - so many possibilities. Thank you for showing this new line. Ohh....I've been eying this stuff! Lovely indigos! I think I would go for a table runner and a mini quilt. Imagine this stuff with Blue Willow-ware and some Ivory Stoneware! My sons would like a cozy little couch quilt. There is a pattern of a bengal tiger's head wall hanging that I have see.......I would do that. Love the back of the pillow using the Cascading Border print! Lovely pillows! I can't tell which I like better, the back or the front! ;) Great work and thanks for the tips. I'm hoping to make some pillows with this line too. I would make pillows or a bed runner. I love these blues. I love your pillows! I would probably make a quilt. Love these pillows. I'd like to make them, or a tablerunner, or placemats, or a tote bag, anything at all so I could enjoy looking at these gorgeous prints every day. I would love to make some throw pillows for my new living room! Wooohooo, i Love your pillows! I think i Would use These awesome fabrics to make a quilt. I'd definitely make some throw pillows. Thanks for the chance to win! Your pillows are so beautiful! I love the navy background - great choice. Do I foresee a pattern to be forthcoming? i would add them into the blue blacks of my EPP tumbling blocks quilt! What a beautiful pillow! Pretty sure I want to go with fabric bins first, then a clutch/pouch... and that's assuming I could make myself cut into them, but they really are too lovely to leave unused. I would love to make patchwork tote bags out of this fabric. Love the classic colors. Your pillows are beautiful. I would like to use this to make a tote or yoga mat bag. Thanks! The pillows would be a nice thing to make. I would love to try your pillow design....stunning! Thanks for the chance to win! Wow, I'm impressed with the fabric line! I would love to make some bags and zippered purses. That tiger's head is amazing! after seeing those amazing pillow, for sure i would love to make some pillow's with the fabric. Love to make a tote. I love your cushions! You have me inspired to make some! thank you! I think these fabrics would be great for a bag. I would make some sort of handbag with this line, as it is just toooo gorgeous for words!! I would use it with my new quick curves ruler to make a quilt...and maybe some pillows like yours!!! I plan is to make some zippy pouches and then maybe some handbags. The examples I've seen may even inspire me to try my hand at clothing! I would love to make a tote bag. Great pillows!! I would love to make a little quilt with this beautiful fabric line. Thank you for a chance to win! I love the simple blue and white pallet and the tigers (I have a long love affair with tigers). I would love to use these fabrics to make something for me. Perhaps an embroidery projects bag. Your cushions are stunningly beautiful by the way - I especially love how your hand embroidery works with this fabric line. Loving Blue color, I woul make some small bags/purses. A lovely fabric line - I think I'd make a tote bag or some description. Gorgeous pillows with some gorgeous fabric. Thanks for the lovely giveaway! Your pillows are gorgeous! I'd make a wall hanging. Beautiful fabrics! I was immediately intrigued by the name as I lived in West Bengal India for over two years. I think that's where I truly fell in love with color! These fabrics would make a stunning quilt and my daughter needs one for her guest room where we stay when visiting the grandkids! Thanks for the chance to win! I would TRY to make pillows just like yours if I were lucky enough to win! 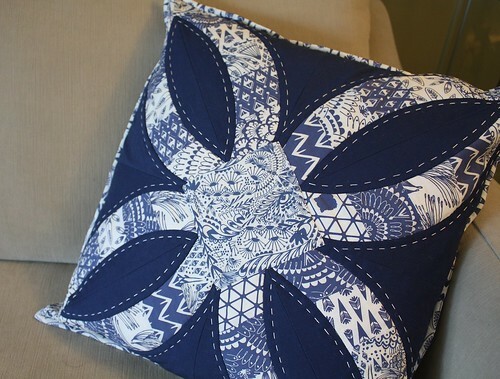 I was blown away by the projects on Hawthorne Threads page and then I see you pillow. Wow! Thanks for the chance. My very first quilt-table runner for my huge barn table, it will match my blue and white china perfectly. Your pillows are gorgeous!! I love everything about them - the prints, the pattern, the backing, the hand quilting...just fabulous! I'd like to use Bengal for some home dec items, like pillows, fabric baskets, and/or placemats. Thanks for the giveaway! What a beautiful use of the gorgeous fabrics! I would make a skirt. Up until this point in the blog hop, I could see bags, bags & more bags being made, but now I've seen your cushions/pillows, I'm liking those too now, so maybe I'd make a Billow....a bag that doubles as a pillow perhaps! I think a Sew Together bag would be great in these fabrics! Can't find my comment! So I'm commenting again - Love the blue and white, the Bengals and the feathers. I'd like to feature the Bengals and feathers in a quit somehow. 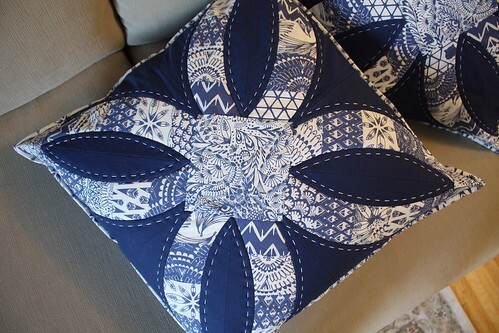 Your pillows are a wonderful way to showcase all the fabric in this collection, thank you for the terrific idea! I would love to make some little clutch bags with Bengal for my girls and nieces. I absolutely love your pillows. :) I would mix it with some hand-woven vintage linen and make bags from them. I would make a many shopping bags as I could. Pulling an attractive bag from the trunk makes the drudgery of errands far nicer! I would make a tote bag and a pillow. This design begs to be seen on my couch All the time! All the shades of blue are just beautiful! Thank you for the giveaway! Your pillows are so lovely. the white big stitch quilting just makes them. I would have to choose the benal panel for a bag. I would love to try some pillows like yours. They are absolutely gorgeous. your pillows are gorgeous! i would love to try my hand at those curves. I would use the fabric for either a bag or some quilt blocks I have in mind. Wow, your pillows are striking! I'd love to give them a try! I want to make pillows too! I love this line. 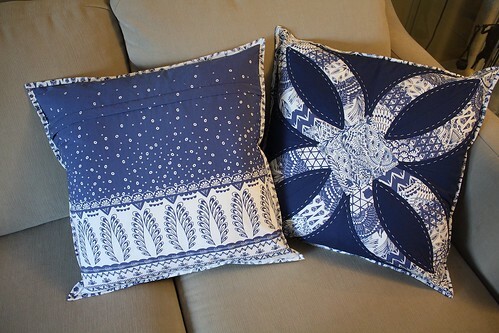 I'd love to make some pillows similar to these. Or maybe use these to make grocery sacks to give as Christmas gifts. I would make a quilted tote or a lap quilt...depending on the size of the bundle. I have been planning on doing Metro Rings forever now, so maybe making pillows like you did would scratch that itch LOL! Just love your cushions, and have just got my QC ruler, but first I would make myself some bags for sewing accessories eg scissors, rotary cutter etc. Oohh great pillows. I'd probably try covering some chairs with this fabulous print! I would love to make an Archer for me with this line. It would look so special! I've always wanted to make a "blue" quilt - Bengal would be perfect for it! Just love the print and would make a dress for myself! Wow, I love your pillows - the color and design are gorgeous. These are my favorite colors - maybe a bag or a skirt! Pillows for my bed! This line matches my curtains perfectly and I've been plotting ways to tie the navy and white into my mostly-neutral bedroom! Your pillows are GORGEOUS! The Bengal fabrics are so striking in your design. I just recently bought a Quick Curve Ruler and the Metro Rings pattern and you've inspired me to move the project nearer the top of my "To Do" list! I'm going to have to purchase some Bengal, too! Thanks for sharing.